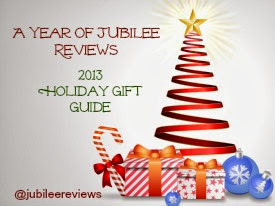 A Year of Jubilee Reviews is hard at work getting ready to start rolling out great reviews and giveaways for the Holiday Gift Guide! The guide will be broken down into categories including Kids, Women, Men, Eco-Friendly, Family, and Food & Drinks. Be sure to stop by often and see what amazing companies I have for you this year! I will take product reviews until November 5th for inclusion in the guide if you are interested.